An interface can be implemented by a class using the implements keyword. Another interface can not implment the interface but can extend it using the extends keyword. The implements keyword should come after the extends keyword if the class inherits from another class. We will discuss inheritance in an upcoming section. 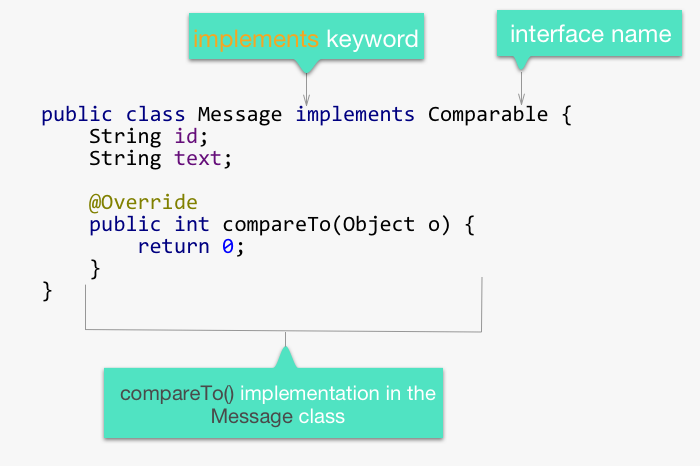 Here is an example of the Message class implementing the Comparable interface. In this example we have used the default code provide by the IDE but we will need to write code to define how to compare Message classes. The Comparable interface define one method, compareTo(). Since the Message class implements the interface, it has to provide the implementation for the compareTo method. A class can implement many interfaces by adding a comma separated list of interface names after the implements keyword. The methods from all the interfaces will need to be implemented. Notice the comma separated list of interfaces(Comparable and List) after the implements keyword. For readability, some methods from the List interface have been removed.